Already a legend within hospitality circles along the glamorous Côtes d’Azur since it opened in 1929, the A-star listing of the Grand Hyatt Hotel Martinez is set to rise even more as room-by-room renovations get underway. New owner, Hyatt Hotels Corporation, which took over the property within the last year, has already refurbished some rooms, with the entire hotel to be re-done over the next few years with plans being considered to have less rooms, but bigger ones, and more suites. With its brilliant white façade, spacious marble-floored lobby and grand sweeping staircase, one is immediately aware this seven-story, 409-room hotel (including 27 suites) has that something special. This became even more obvious as we gazed from our French balcony (a sea-view 40sqm deluxe room on the fifth floor) over downtown Cannes, the revered beaches of the Riviera fanning out below and the Esterel Mountains in the far distance. This 5-star property draws its architectural inspiration from the art deco era that first appeared in France after World War I and began flourishing internationally in the 1920s. Wandering around the hotel, with its chic combination of traditional craft motifs, Machine Age imagery, bold geometric shapes and lavish ornamentation, made me think of The Great Gatsby. 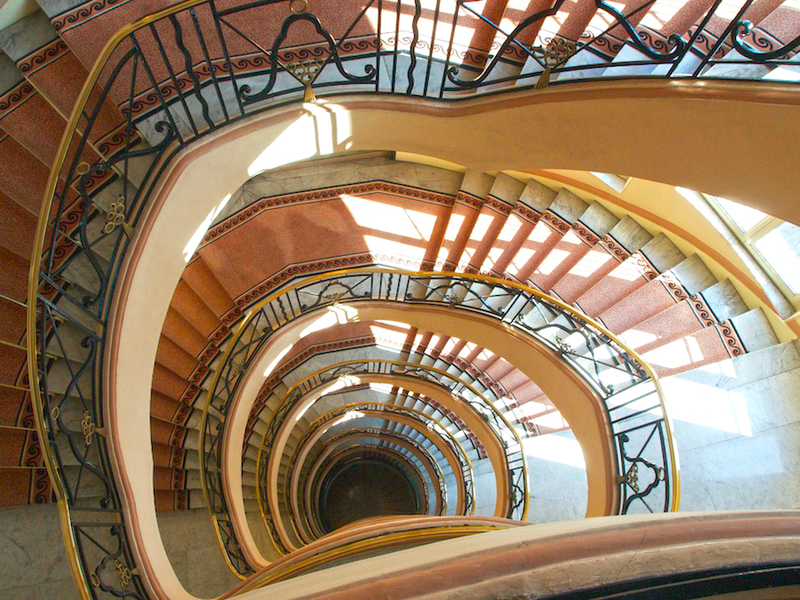 Gazing straight down into the dizzying swirl of the ornate central staircase (protected under French law as an historical monument) is enough to transport one back to the ‘années folles’ (‘the crazy years’) of social, artistic, and cultural dynamism. The lush colors in our room and the hand of opulence in the design of our spacious bed encouraged notions of time-travel even more. It comes as little surprise then that the hotel’s vast Penthouse Suite was once billed at $37,500 per night and thus the fourth most expensive hotel suite in the world by CNN two years ago. Of course, the inherent comforts of such a luxury property extend far beyond enticing marble bathtubs and sensuous silk curtains and bed covers. There’s also the discreetly walled 30-degree heated swimming pools and terrace out front on the ground level beside ‘Le Relais’ restaurant, ‘L’Amiral’ piano bar and the private ‘Zplage’ beach a few steps from the main entrance across the double-lane Croisette. Not to mention the 2 Michelin starred ‘La Palme d’Or’ restaurant. It’s thus little wonder such movie celebrities as Steven Spielberg, Michael Douglas, Bruce Willis and Nicole Kidman chose to encamp here during the annual famed film festival, which takes place at the Palais des Festivals et des Congrès a mere ten blocks away. In tribute to an earlier celluloid era, you can also browse vintage black and white photographs of Brigitte Bardot, David Niven, Claudia Cardinale and former French heartthrob, Alain Delon while you sip the hotel’s special ‘Cosmopolitan Martinez’ in L’Admiral. Living up to its high status, glass presentation cases dotted around the hotel’s cream, gold and chocolate brown lobby feature Eres swimwear, Berluti and Mercedeh shoes, as well as Chanel handbags. Svelte bronze sculptures of Aphrodite and Eve by JL Landraud stand side by side in the center lending an added air of sophistication to the overall ambiance. Weather being friendly, dining alfresco at ‘Le Relais’ restaurant, where breakfast is also served, is an enjoyable experience. Located near the pool, guests sit among palm and olive trees, at simple square glass tables on whicker chairs. The menu created by head chef Christian Sinicropi reflects a Latin theme, with Picore starters as a series of tapas for two, sourced from either land or sea, guest’s choice. The Picore de la Terre, for example, includes vitello tomato yakitori, osso bucco cannelloni, acidulated poultry medallions and beef tartare. The chef’s ravioli are filled with sweet chard, basil and ricotta, and the secreto of Iberico pig is slow-roasted and served with grenailles potatoes. Service at the Martinez, as expected, is exceptional with eight golden key concierges on the staff. The hotel also boasts its own exclusive fragrance, ‘73 La Croisette,’ for all its toiletries, created in co-operation with Isabelle Bourdel, a Cannes-based perfumer. For scent lovers, the breakdown is verbena as top note; jasmine, rosewood, vetiver and cedar as middle; and patchouli, amber, sandalwood, tobacco and Mediterranean rock rose as base notes. The Grand Hyatt Cannes Hôtel and the town itself owe much credit to English Lord Brougham who – history has it – stopped over on his way from Italy in 1834 when it was merely a tiny fishing village and raved so much about it back in his homeland that many fellow aristocrats promptly flocked there for the mild winters and fine beaches. Now, with the onward march of modern transport, the hotel is only 30 minutes from Nice-Côte d’Azur international airport and five minutes to Cannes train station. Aside from leisure guests, the hotel has also developed its convention business offering over 2,500 square yards of conference space including 15 meeting rooms. L’Raphael spa, located on the seventh floor, has nine treatment rooms. Offering a convenient location to downtown Cannes, attractive art deco ambiance, an illustrious history as well as excellent service, the Grand Hyatt Cannes Hôtel Martinez remains a legend along the French Riviera. Posted in Luxury HotelsTagged Alain Delon, art deco, beach, Berluti, breakfast, Brigitte Bardot, Bruce Willis, Cannes, Côtes d’Azur, Chanel, Christian Sinicropi, Claudia Cardinale, CNN, Cosmopolitan Martinez, Croisette, David Niven, Eres, Europe, fine dining, France, French Riviera, gastronomic, gourmet, Grand Hyatt Hotel Martinez, Great Gatsby, heartthrob, historical building, Hyatt Hotels Corporation, Le Relais, luxury accommodation, Martinez, Mediterranean, Mercedeh, Michael Douglas, Michelin star, Nicole Kidman, Palais des Festivals et des Congrès, Penthouse Suite, restaurant, spa, Steven Spielberg, The Grand Hyatt Cannes Hôtel, The Great Gatsby, travel, vacationBookmark the permalink.